WESTMINSTER, CA--(Marketwire - January 21, 2008) - Noran Engineering, Inc. (NEi), a global leader in the development of Nastran engineering analysis and simulation software, will demonstrate how pre and post processors Femap®, NEiFusion™, and NEiWorks™ powered by new features in NEi Nastran™ solvers assist both designers and FE analysts perform simulations faster, easier, and with better real world fidelity. Digital prototyping technology developed by NEi enables product developers to determine the response of parts and assemblies to structural and thermal loads early in the design cycle saving time, money, and resources on physical prototypes, test programs, and redesigns. NEi's products have been cited in several trade magazines for technical merit. Most recent, NEi received Design News magazine's Golden Mousetrap Award for Best New Analysis and Calculation Software. New virtual testing tools in NEi's portfolio include: Automated Impact Analysis and Drop Test (AIATM), Design Optimization, Automated Surface Contact Generation (ASCGTM), Automated Edge Connection Generation (AECGTM), and hyperelastic and composite material modeling. AIA is used in a variety of areas from military projectiles to product packaging to drop testing of consumer electronic products like cellphones. Design Optimization finds solutions for complex designs with conflicting parameters, e.g. structures that must be both strong and light. ASCG provides real world fidelity in modeling assemblies. AECG is a major productivity tool that significantly speeds model creation for shell type structures like, cars, ships, and aircraft. 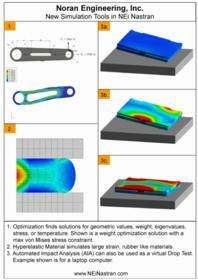 Hyperelastic capabilities allow modeling of rubber-like materials. NEi is at Booth # 3505 at the Pacific Design and Manufacturing Show, January 29 - 31, 2008 at the Anaheim Convention Center, Anaheim, CA. NEi invites attendees with an interest in virtual test software to sign up prior to the show at www.NENastran.com/PDM2008 so material may be prepared that can address their specific application. NEi is a global leader in Nastran finite element analysis (FEA) and simulation software. Engineers gain design insights early in the development process with digital prototypes that provide graphic visualizations of stress, deformation, vibration modes, heat transfer and other engineering parameters. Companies gain a competitive edge with a faster, less costly product development process that delivers more innovative, reliable, and higher quality products. See the website for applications by leading companies and video demonstrations. Website:www.NEiNastran.com | Telephone: 714.899.1220 | Email: info@noraneng.com. About this company Noran Engineering, Inc.